Golden pearls are one of the most beautiful and sought after pearl colours. With an opulent shade reminiscent of fine champagne, golden pearl necklaces look simply luxurious, they can be found adorning the necks of some of the globe’s most glamorous women. We offer you a golden opportunity to enjoy this luxury look for less, with a wide selection of great value golden Akoya pearl necklaces, alongside our enviable oversized South Sea golden pearls. Hand selected for a rich, regal lustre and a virtually blemish free surface, and finished to perfection with fine yellow or white gold, our golden pearls are truly peerless when it comes to capturing the luxury of the champagne lifestyle. 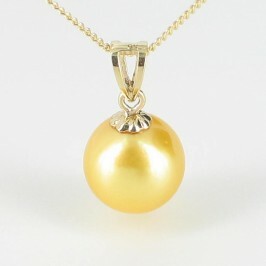 Golden pearls are a gorgeous, glamorous gift that will surprise and delight any woman. Pair a golden pearl necklace with golden pearl studs or drop earrings to give her that total film star style. Or, for that truly special occasion, invest in the best with an incomparable string of extravagant oversized South Sea golden pearls and you’ll leave her simply speechless.